Stay on U.S. 1 / Boston Post Road. At the fourth light take a left onto North Street. Proceed about 100 feet and take your first left onto West River Street. 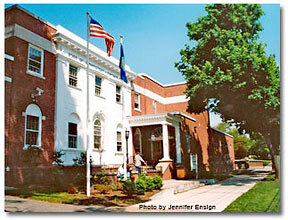 Go down West River Street, courthouse is first building on your right after driveway (Constitution Drive). At the third light take a left onto North Street. Turn right onto U.S. 1-N / Boston Post Road. Go straight through the intersection of U.S. 1 / Boston Post Rd. onto North Street. M-F 9 a.m. to 5 p.m. Doors open at 8:30 a.m.
Free public parking: 0.2 miles from the Courthouse down Constitution Drive at Wasson Field on the left. There is some on-street, metered parking available around the Courthouse. Juror Parking: Parking is available behind courthouse in Third Bay area with designated slots indicated by Jury signs. 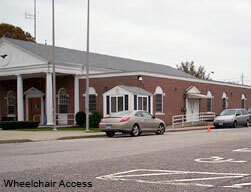 Wheelchair access is in the rear of the building near the designated handicapped parking. A wheelchair ramp into the facility is a short distance from the accessible parking. Intercom access at the entrance is necessary to summon a Judicial Marshal, who will then allow you access into the building.